Here’s a plate to brighten up this cold and dreary winter! It’s almost March, but there’s still snow on the ground and my spring jackets are still tucked in the back of my closet. I know we’re all yearning for spring, but it will come soon enough. 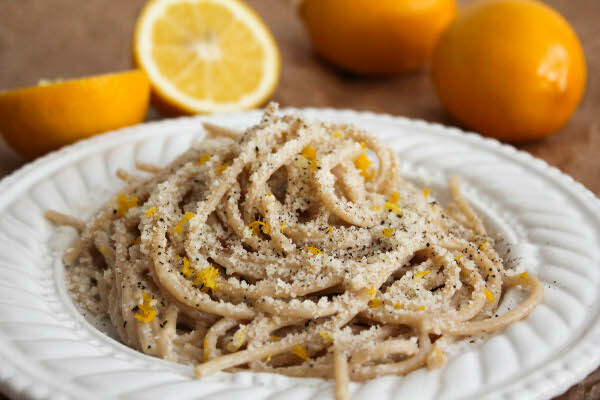 In the meantime, please treat yourselves to Spaghetti with Meyer Lemon Cream Sauce. This is nice transition dish from winter to spring, a little plate that straddles the line between comfort and freshness. It wasn’t food; it was magic on a plate, and for a moment I disappeared into the flavor. Ruth Reichl’s memoir was one of the first books that really made me love food writing. Here is someone who can write about not just the flavors and the taste and the scent of food, but also seamlessly weave it in with her stories and memories. I eventually forgot about making that lemon pasta but I never forgot what she wrote, and how she wrote. 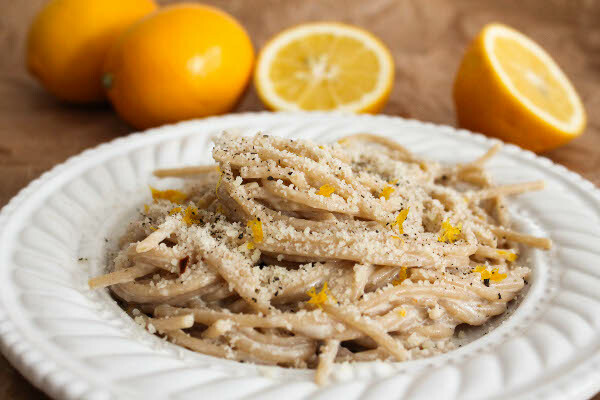 Recently I made my own version of the pasta, this time using Meyer lemons. 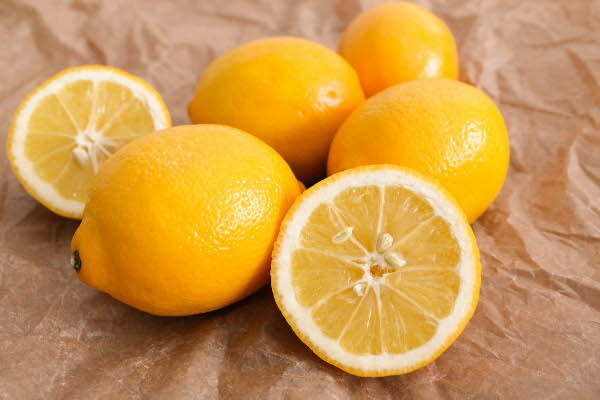 Meyer lemons are like a cross between a lemon and an orange. They’re sweet and not as tart as their more ubiquitous cousins. They’re smaller with a thinner skin that has slightly more orange tint, and they come into season during mid-winter to late spring. They’re delicious. The pasta sauce is rich – made with cream and a little butter – but the creaminess is tempered by the bright fruity flavor of Meyer lemon. 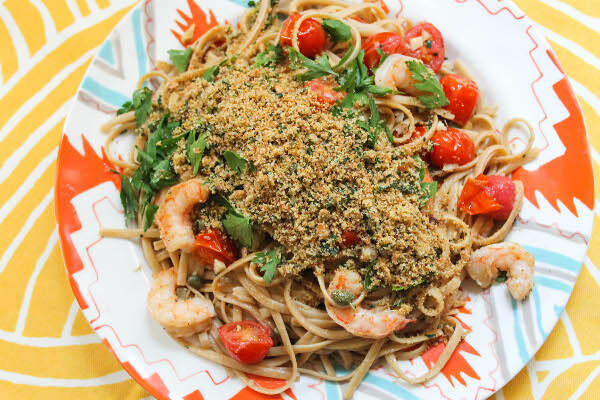 I added a pinch of red pepper flakes for a little kick of spice, and finished the dish with a generous sprinkling of grated Parmesan cheese, more lemon zest, and freshly ground pepper. 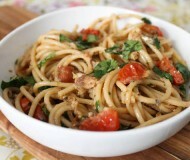 I used whole wheat spaghetti but this would also work well with flat fettuccine or even egg noodles. I imagine adding a clove or two of garlic will add another depth of flavor, or adding some basil leaves would be nice, too. This pasta would also pair well with asparagus or spinach. Of course the Meyer lemons can easily be replaced by regular lemons. The pasta taste like the marriage of a citrusy alfredo and cacio e pepe. 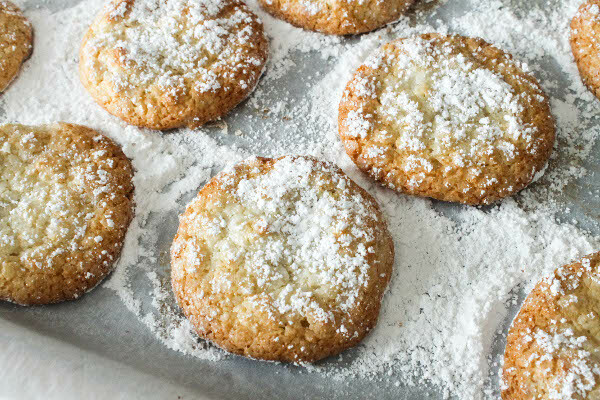 Creamy, salty, and bright. Magic on a plate that can help you leave winter behind. In a large sauté pan, melt butter over medium heat. Add cream and lemon juice, stir together. Transfer cooked pasta to pan, along with half of the grated Parmesan cheese, half of the lemon zest, and chili pepper flakes. (You can also add the reserved pasta water, if you’re using it.) Toss until the sauce coasts spaghetti evenly, and season with salt and pepper. 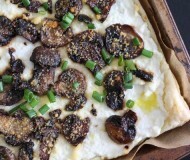 Serve with remaining cheese, fresh ground pepper, and remaining lemon zest. If you haven’t tried Meyer lemons yet, I encourage you to look for them in your grocery stores or farm stands and buy a few soon! 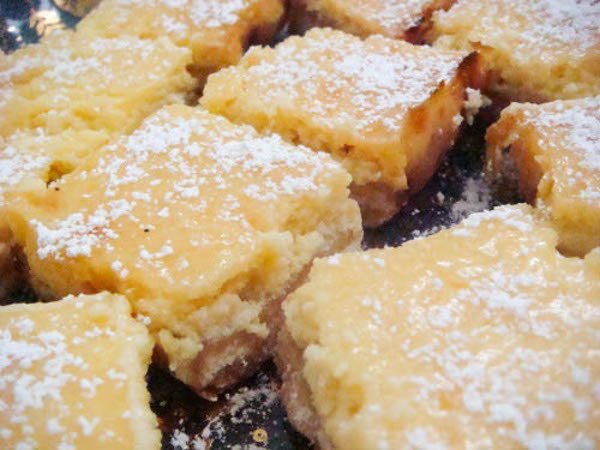 Meyer lemons lend the perfect sweetness and aroma to pasta, and will also work beautifully in desserts. Have you ever cooked with Meyer lemons before? Tell me about your favorite recipe! Thanks, Jenny! It’s a great book. Now I want Meyer lemons! I love Meyer lemons. The pasta looks delicious along with everything else. Isn’t Ruth Reichl an incredible writer? I was on a food-memoir kick a while back and I devoured her books; they were my favorite. And you have described this pasta beautifully. It sounds too good. I don’t love meyer lemons but you’re convincing me to re-examine that. Admittedly, I don’t have much experience with it and I’m sure it’s all a matter of finding the right recipes. I go through phases where I only want to read food memoirs, then I give myself a break and switch to fiction. But yes, she’s an inspiring writer. Hope you give this lemon pasta a shot! I love the idea of a lemony pasta. Your round up looks great too! I definitely need this bright cheery dish – this winter is a killer! :( Have a great weekend! The meyer lemons on my counter are SO destined for this! This looks positively delicious! Love the brightness from the lemon zest. this is great for those meat-free fridays during lent!! This looks fantastic! 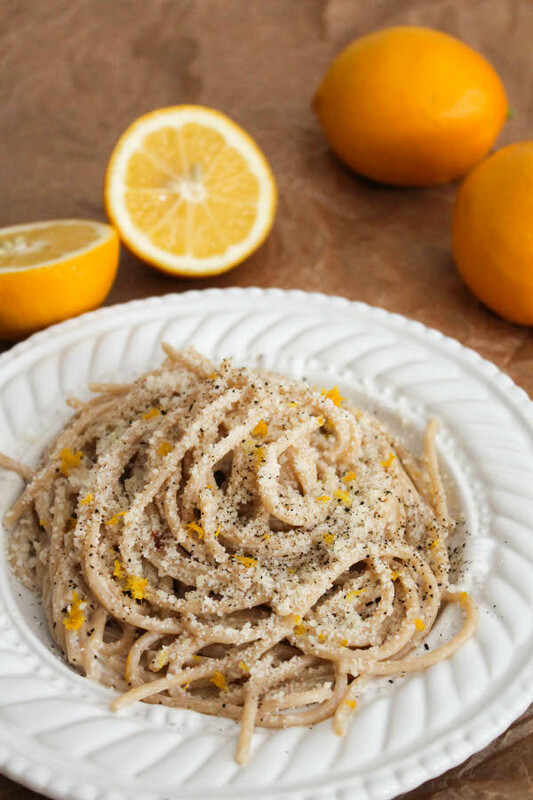 Love citrus with pasta! What a gorgeous meal! 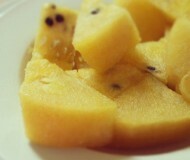 Lemon + pasta is the best!! Beautiful photos!